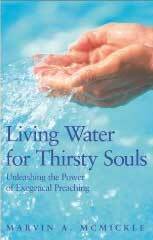 For my Homiletics class this week, I had to read Living Water for Thirsty Souls by Marvin McMickle and write a book review about it. McMickle addresses 8 areas of exegetical preaching: (1) Limits, (2) Literature, (3) Language, (4) Location, (5) Leads, (6) Links, (7) Lessons, and (8) Life Application. I can't say that I would recommend this book as a first book for learning how to preach. While the book does provide exposure to the exegetical process, the examples of sermons in the book surprising do not always seem to follow the advice given in the book. Here is my conclusion in my review. This is not a fact. They are coming. The largest and fastest growing churches in America are filled with those who are spiritually hungry and want to know what God has to say to them. Weekly our teaching pastors at Crossroads in Mansfield see people from all walks of life enter our auditorium, because they are curious, spiritually hungry, and because of God’s good grace. How do I, as a preacher, speak to these thousands of adults in a winsome way that communicates God’s message straight from His Word? Most sermons we read in the New Testament did not deal with the inequities or hardships of life, but rather with the powerful message of God’s love expressed through His son, Jesus. As a result of one sermon, thousands responded and were baptized into the faith. How do we preach that same message today? Should we not expect the same results today? If you have a desire to read the full book review, you can download my Word document.